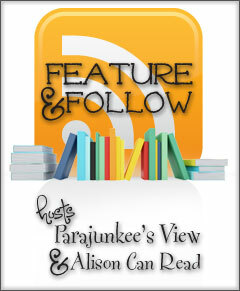 Welcome to Feature & Follow Friday, hosted by Parajunkee’s View and Alison Can Read! I’m going to make it short and sweet this week, because we’ve got the makings of an awesome storm outside (please rain, oh please oh please oh please. Our poor straw-like grass is thirsty) and our power keeps flickering. And Bly “flickering,” I mean it flickered, then turned off for half an hour while my kids FREAKED OUT and my 3-year-old asked if our apartment was going to flood and we were all going to die. Never mind that it’s not even raining yet. So this is going to be short and sweet. If you are new to my blog, I’d love it if you would follow via LinkyFollowers, Networked Blogs, email or RSS. If you let me know that you’re following in the comments, I’ll return the favor! Okay, I know I mention this book a lot, but I’m going to go with Outlander by Diana Gabaldon. While there is a tiny amount of sci-fi thrown in because of the time travel element, it is mostly a mashup of romance and historical fiction — neither of which are genres I frequent. Oh, I love a sprinkle of romance in my books, to be sure, but I pretty much never, ever read straight-up romances, especially not steamy ones. And Outlander has plenty of steam, and history, and I love it bunches. 1) The kindle version was free on Amazon (sadly, that is no longer the case). 2) A good friend recommended it to me, and I place unwavering trust in her recommendations. I still can’t say I dabble regularly in historical fiction or romance, but I’ve revisited this book several times since my initial read, and if it’s even possible, I love it more every time. Time to go shut down my computer and possibly huddle in the dark. Don’t worry. We have Pop Tarts, so I think we’ll survive the night. This entry was posted in Blog, Feature & Follow and tagged alison can read, Diana Gabaldon, Feature and Follow, Outlander, parajunkee's view. Bookmark the permalink. I haven’t heard of this one, historical is a genre I steer clear of too. Glad you liked it though! Hope the storm passes over but not before you get some rain. I still have to read this book, not sure what I’m waiting on because it has everything I love in a book. We actually DIDN’T get any rain, which was ridiculous considering the clouds and the wind and the general stormy-ness, but it rained briefly today. So that’s something. Read it! Hopefully you’ll like it! That’s awesome! I’ve only read it twice, and still haven’t finished the series – but I’m working on it! Neat! I’ve never heard of that book. Maybe I’ll look into it! New follow. Hopping through. Too bad the Kindle version isn’t still free. I’ve always meant to read it. I haven’t heard of this book at all, probably because historical fiction doesn’t really do it for me. But I will say that I started following your blog today purely on principal – I absolutely love the name of your blog. The Housework can wait. Brilliant. Anyway, happy Friday, here’s hoping you have a minute to drop by my blog for a follow back and a read! I love the Outlander series. Wow, we’re such opposites, lol. I LOVE, LOVE, LOVE historical romance. Especially when scots with kilts are thrown in there. Or old Englishmen with titles… *swoon* But I’m glad you branched out because Gabaldon is a genius! And your 3 year old is hilarious and reminds me of MY 3 year old. Every time I tell him not to do something because it’s dangerous, he says, “why? because then we die?” LOL.Gotta love them. New follower – I followed via linky. You can find my FF here. What is it with 3-year-olds and their bleak outlook on life? I don’t get it. THEY’RE THREE. Old follower hoping through. I love Kindle free reads, they get you outside your box! If you dont like it, it was free no harm. I definitely don’t read many history novels. This book is new to me. Glad to hear you enjoyed it! Hope you weathered the storm, have a good week-end. I have the whole series to read but I confess I haven’t tried one yet, I really need to! I haven’t finished the series yet (I’m on the 5th book). So far, the first is still my favorite, but the others are still very good. Outlander is the best. I love historical romance though.